Real estate agents bill: a done deal? Last night Parliament passed the Real Estate Agents Bill, sweeping away the old and seriously ineffective self-regulatory regime operated by the Real Estate Institute of New Zealand. When the new Act comes into force in 14 months or so, consumers who feel ripped off will be able to claim up to $100,000 in compensation against agents from an independent Disciplinary Tribunal. At little cost. At the moment, agents may be fined up to $750. Which the Institute can keep if they want. I wonder who he was talking about. The Nats voted against the Bill, saying property managers should be covered by its provisions. They also say, “at the end of the day the consumer will not have more protection than under existing legislation.” Bizzare. What the Herald doesn’t mention in this morning’s report is that Cosgrove has also claimed that the REINZ president told a Palmerston North gathering that the bill would not pass until after the election and that the Institute expected the National Party to make changes in the industry’s favour. So, a victory for the consumer — for the moment — and an end to a system of self-regulation so ineffective that it is widely mocked as it dies a well-deserved death. Another poll shows the gap between National and Labour closing, to 6.5%. It confirms the trend revealed by other recent poll results. The latest Roy Morgan poll — of 841 electors over 18–31 August — shows National at 44.5% (down 3.5%) and Labour at 38% (up 4%). Bad news for NZ First, down 4% to 2.5%, with the others largely unchanged: Greens at 8% (up 0.5%), Maori Party at 3.5% (up 1.5%), ACT at 1.5% (no change) and United Future at 1% (up 1%). The previous Morgan poll was conducted between 28 July and 10 August, so would not have included much of the impact of the loose lips debacle. The current one does, along with much of the Peters saga. The interest rate cuts may have helped, and there are more of those on the way. It is only one poll, but should it prove accurate then the Peters saga has affected NZ First but not Labour or ACT. This would not be a surprise, as most NZers probably understand only too well that had Labour done as National suggests, and shut out Peters, then we would simply have had an early election. This doesn’t seem to be wished for outside the right-wing blogs and John Key. According to Tane’s calculations the latest result puts a Labour-led coalition in by a nose. Morgan on the other hand say that, “If an election were held now New Zealand would have a Coalition Government likely to be led by the National Party.” Even though Tane doesn’t factor in the overhang from the Maori Party seats, it looks as though the Maori Party would hold the balance of power. But this is really beside the point. Political events in NZ are moving at a breathtaking pace, and anything could happen between now and the election, whenever that is. She recounts that when she put this to Peters at the time, he assured her that his party had not received a donation from Glenn. Technically, he was right; his fighting fund received the money. Clark said that every time the issue arose she rang Peters and asked for his word. And got it. True. It’s not really sustainable to know something like this and simply accept Peters’ word for it. It needed to be investigated properly, for the sake of the body politic, if nothing else. Peters may indeed never have made the call, or may be utterly mistaken about that (though it’s hard to see how you could be mistaken about asking someone you’d only met a couple of times for a $100,000 donation). But that’s not the point. Cabinet ministers need to be seen to be acting properly. The Herald’s editorial this morning goes to some length to ignore logic in a desperate bid to parrot today’s National Party talking points. Problem is, it doesn’t come down to “who has the most to gain by not telling the truth.” If it did, I’d be 99% inclined to go with Peters having the greater motivation, but would still be mindful of Glenn’s estrangement from Labour that Farrar and co want us to overlook. I’ve added the emphasis, because this is the point at which the analysis should have started. Belatedly the Herald admits that its reasoning is based on overlooking the point that the conflict of evidence may not result from one (or both) lying. The problem is that the Herald does not demonstrate that “neither of them is honestly mistaken in his recall”. I wish it could. This sort of stuff puts the Herald in the same league as Farrar, who begins his post, “Owen Glenn has told the truth in his letter to the Privileges Committee.” I’m now strongly of the opinion that right-wing bloggers should be exempted from all jury service, because of the way they rush to judgement! Key held off as long as he could before taking a stand. Courageous? What a joke. Perhaps it pays not to snub billionaires, Helen? Labour’s “on the move.” So says TV3 News, reporting the latest 3News poll. The poll confirms the trend revealed by other recent poll results. A slight bounce for Labour, National maintains a decisive advantage, with the loose lips debacle not having made much impact… yet. National remains on 48%, Labour is up 2 points at 37%, the Greens are down one point on 6%, NZ First’s on 3%, Act 2%, and United Future 1%. A little under 3 months out from the election this is good news for Labour, who need to start closing the gap. If the Greens and NZ First make it back into Parliament, then it doesn’t have too much more ground to make up before the election starts to look very exciting. The minor party results probably don’t mean too much, although it doesn’t look like the donations saga has done Peters any good. The poll of 1000 voters was taken between August 14 and August 20, and has a margin of error of 3.1 percent. “Significantly, one of the attendees at this dinner was Hutt South National Party candidate Paul Quinn who, on current polling, looks like entering Parliament at number 48 on the Nats’ list later this year. Now, we mustn’t forget that the Maori Party normally determines its post-election strategy in a series of hui. 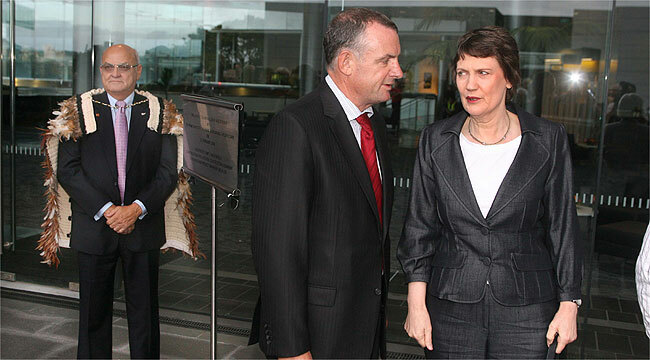 But they learnt last time that it doesn’t pay to be “last cab off the rank”, as Helen Clark put it dismissively. The One News Colmar Brunton poll just out confirms my reading of the two other polls released late last week. Taken more recently (Saturday week ago to last Thursday), the Colmar Brunton poll confirms a slight bounce for Labour, up 2 points to 37%. This appears to be at the expense of the minor parties, however –with none of the smaller parties polling above the 5% threshold in this poll. Further, National’s support has not been affected by the secret tapes and loose lips affair. At 51% National is still polling well enough to govern alone. I don’t expect either situation come election time. NZers have proven themselves extremely adept at fine-tuning the final result, and we can confidently expect sufficient green-leaning Labour voters to peel off to save the Greens, if this looks necessary on the day. Likewise, I’d be surprised if the voters give National a total mandate to govern alone. Why would they? They are still too much of an unknown quantity to be allowed to govern without check (and ACT doesn’t qualify as a check for more than 90% of the electorate, probably). The two mid-August polls released to date show little evidence of a bounce for Labour out of the “loose lips” debacle for National. Roy Morgan’s poll shows National steady at around 48% and Labour returning to its May level of around 35% after a few months in the 30-32.5% range. Perhaps a bounce, but pretty small at best. More interestingly, confidence in the Government has bounced back “strongly” to 103.5, after falling from over 120.0 last September to bottom out at 87-88% in late June-early July. And more NZers (44.5%, up 6%) say the country is “heading in the right direction” than say it is “heading in the wrong direction” (41%, down 6%). So some good news for Labour. Not so the Fairfax Nielsen poll. This shows Labour steady on 35% and National up 3 points to 54%. The Morgan polling period was 28 July–10 August (N = 834), so the effects of the loose lips stories that broke on the evening of 3 August would be diluted. The FN poll was conducted over 6 August–12 August (N = 1102) and includes the effects of the loose lips — although some respondents would have been polled before the story had fully unravelled. It is also more likely to be accurate given the larger sample size. Still, even if there is no immediate pay-off for Labour from the loose lips debacle, the episode may prove valuable in the long-run. Garner imagines Labour putting together advertisements that feature English and his comments as part of a campaign based on trust, leadership and privatisation. I’d say that last week’s events might prove very useful to Labour as it seeks to build a narrative around “hidden agendas”. Therese Arseneau of Canterbury University muses on “Is Labour’s success beyond its control?” for OneNews (Hat-tip: Idiot Savant). I’ve argued before that this government has increasingly given the impression of being out of touch, if not arrogant, in its approach to unpopular issues like the EFA and anti-smacking reform. This hauteur is sometimes quite tangible when talking to members of the government, whether elected or not. Labour’s best chance, thinks Arseneau, is to paint National as risky. This worked in 2005. But then, Don Brash was never going to be convincing as a moderate, was he? The problem this time is that National have figured how MMP works — only took them 12 years — and are concertedly following the MMP script. That’s what makes last week’s serial taping so important. Two, maybe three or more MPs let their guards down and almost gave the whole game away. Much more of this and Labour gets very competitive. My guess is that National have learnt from last week’s close call, and will be more disciplined from here on in. And finally Arseneau thinks that the Greens’ support of a Labour-led government depends on a smallish gap between the two main parties. There’s something in that I’m thinking. I think that the range of scenarios boils down in the first instance to those with NZ First in Parliament, which probably means NZ First getting more than 5% of the total vote, and those without. In the not-at-all unlikely event that Labour finishes second, it’s not close, National/ACT falls short of a governing majority and NZ First is returned, then I think that the Greens and the Maori Parties are in a difficult position, as Arseneau says. They must balance what the public will accept, and the extent that they are prepared to accept those National’s policies that are hostile to the environment and the low-paid. In sum, Labour’s chances hang by some pretty slim threads. “Labour is not a passive victim of whatever other parties do, a “log floating down a river”. Even more than the bully-pulpit of government, an election is a chance to shape our political conversation and shift the political ground. If National is pretending to seek the centre, then Labour should be seeking to define it, by staking out ground in popular policy areas where National can never compete – things like universal student allowances, paid parental leave, housing, and privatisation (though they already have the latter firmly in hand). I’m not sure that there is ever enough time in an election campaign for moulding attitudes at that level. That boat’s left port and is fast disappearing over the horizon. There was a chance to build a narrative around the future, to supplement the great work Labour did in repairing the damage to the social fabric wrought by the neo-liberals in the 1980s and 1990s. Instead, some fine principles were pursued, and the narrative building didn’t happen. You’d never know that there is an election imminent. Two months ago Health Minister Cunliffe slagged off striking doctors for being “unrealistic“, backed up by CTU President Helen Kelly, of all people. Now Education Minister Chris Carter has told a group of North Shore secondary school principals protesting against inadequate funding to “stop moaning and start teaching“. Primary school principals are considering joining the protest. Carter points out that the Government has spent $5 billion on education since 1999. This year’s amount represents 4.4% of GDP and compares with 3.5% in Australia. He’s right. But it appears that he’s the only person in the country who isn’t aware of the problems schools have experienced with their funding for maintenance, amongst other things. One thing’s for sure, dissing the hard-working people who struggle to keep our schools and hospitals functioning is not a sure-fire fix for sagging poll ratings.